I guess it’s human nature to think of one’s homeland in terms of superlatives. The more places we go, the more it becomes apparent that each locality prides itself on something, claiming to be the biggest, the brightest, the oldest, the freshest, or somehow the most sublime. Cape Breton claims to have the world’s largest inland sea, Bras D’Or Lake. The lake has only one opening to the sea, a 200-yard-wide gap at the north end of the Great Bras D’Or channel. Sea water floods and ebbs through this gap with the rise and fall of the tides, creating strong currents and flushing the lake with salt water. 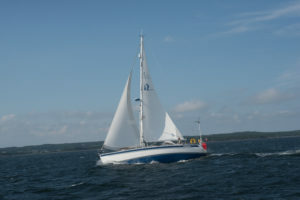 Windleblo as seen from Yarona on a beam reach off Isle Madame on the way to St. Peter’s Canal. Streams and rain drain into the lake, diluting and warming the salty water. 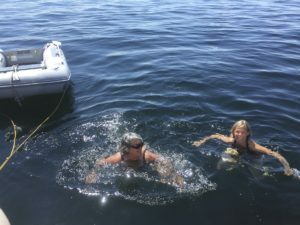 Because the water temperature can rise to 70 degrees Fahrenheit in summer, Cape Bretoner’s claim the lake is one of the most swimmable in Canada. The lake’s 600 miles of coastline support the “largest inland sea” label. post built by French merchants, a 15-year construction period, and evolution as a contemporary waterway, opening up Cape Breton Island development. Ending our week-long rally, we left Yarona on a mooring ball in St. Peter’s village, bent on exploring the lake’s natural harbors. 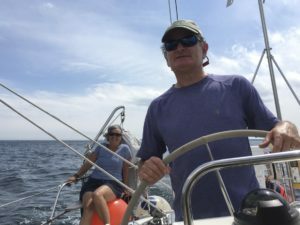 Our plan to sail west to a place called “Little Harbour” was foiled by strong west winds; we turned to starboard instead and headed downwind to find refuge in a quiet anchorage called Johnstown Harbour. A peaceful night ensued. The next day dawned clear with light winds. We resumed our cruise toward Baddeck, but soon the wind died leaving us with a choice — fire up the engine or dawdle and swim in the wide open middle of the lake. We chose the latter and, as if on cue, the wind picked up again just as we were done swimming. We steered through The Narrows, which connects Great Bras D’Or Lake with the St. Andrews Channel. 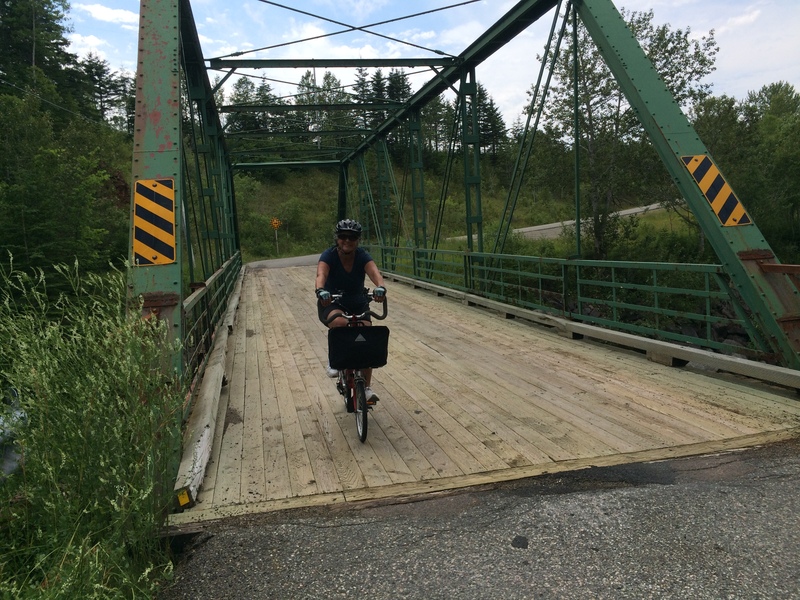 Here, we encountered a railroad swing bridge and a highway drawbridge. The rail bridge was permanently open. We guessed no train had come through here in a long while. We hailed the highway bridge tender on Channel 10 and he welcomed us to come ahead. On cue, he raised the bridge and we passed through under the watchful eyes of a handful of Cape Breton motorists. An hour later we were anchored in Maskells Harbour. Originally called Bouliceet Harbour, Maskells Harbour is surrounded by steep rolling hills and is almost landlocked by a sandbar stretching across the entrance. A defunct lighthouse guards the entrance. The majority of the land fringing the cove is privately owned and the owners have chosen to refrain from development of any kind thus retaining the natural beauty. We dinghied to the head of the cove and waded among the reeds, seeing mussels, clams, crabs, and oysters galore. 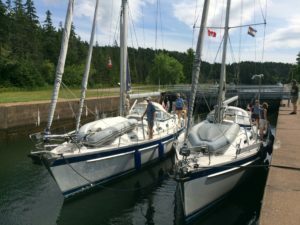 We caught up with Yarona again in Baddeck, the adopted home of Alexander Graham Bell and de facto capital of the Bras D’Or Lake region. We immediately resumed our merriment, sharing rounds at the yacht club and enjoying many meals together. 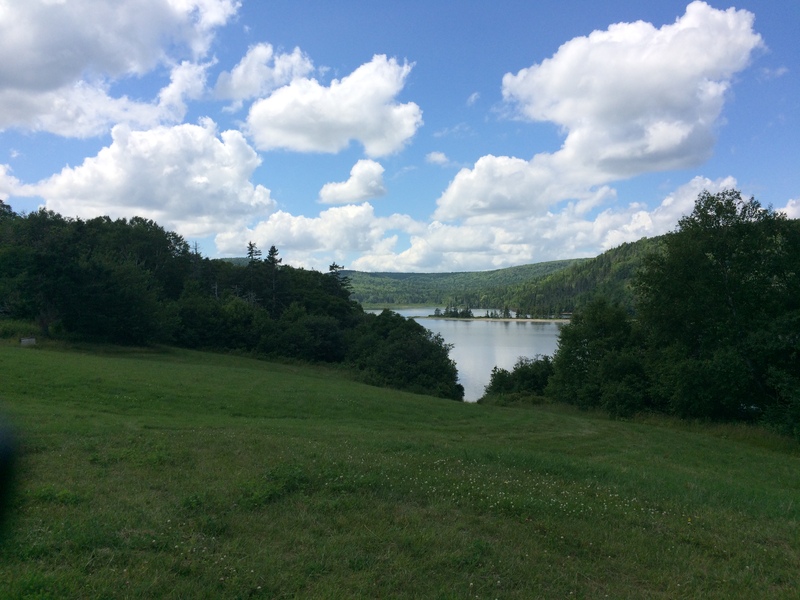 During the day, we took in the Alexander Graham Bell museum and explored the surrounding countryside on bicycle, returning for a swim off the transom in the harbor’s clean water. 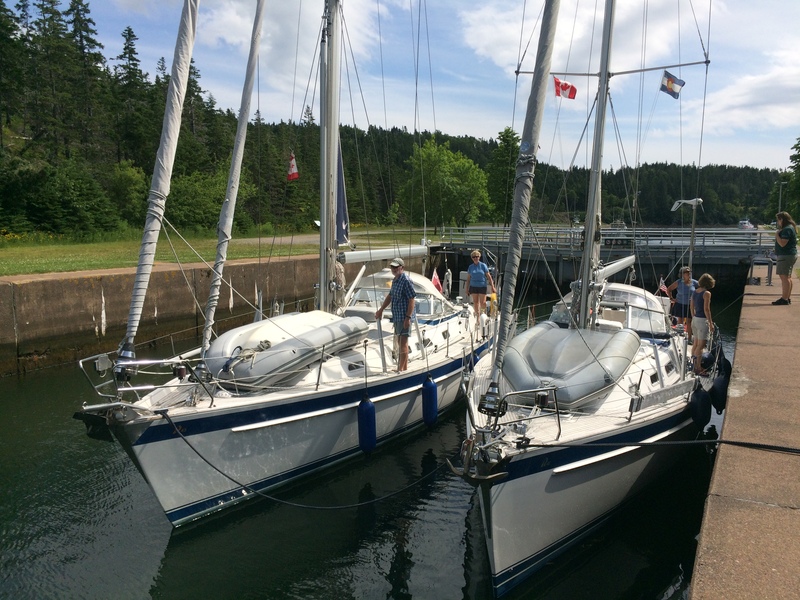 Karolina’s time aboard ended too quickly, marked by a delightful dinner out at one of Baddeck’s fine restaurants. We thank Karolina for her help running the boat and look forward to her return.